The Gardens at Pineland Farms - Pineland Farms, Inc. Welcome to the Gardens at Pineland Farms. All of our professionally designed gardens are created and maintained for the public to enjoy and learn. The Garden, Lilac Garden and Annual Beds around Campus and the Great Lawn are available free for all to enjoy from 8 am until dusk. Gardens located on Valley Farm can be accessed with a Farm Visitor Pass available at the Market & Welcome Center. During your visit to Pineland Farms please enjoy these educational resources meant to help connect you to the natural landscape. Located at the Garden on Freeport Rd. across from the main Pineland Farms Campus. Two tours available each month June, July, August & September. Check Facebook Events or our Event Calendar for dates & times. Enjoy and relax in the beautiful garden surroundings. Stroll the winding paths or mingle with friends. We’ll be there to answer your garden questions. Iced Tea and light Pineland Farms refreshments will be served. $8 per person. Use your cellphone camera app along the trail to scan the QR codes at each stop. An informative page about the tree or plant in front of you will pop up. For more information please contact our Grounds Crew. 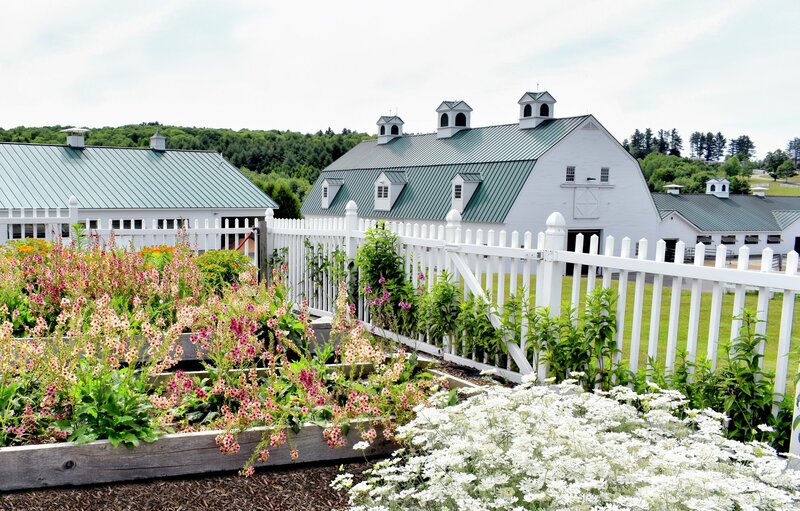 The one-acre perennial, herb and vegetable Garden at Pineland Farms is a wonderful place to stroll along a quarter-mile of paved walkways, picnic on the lawn in the shade of the apple tree allée, or simply sit on the Adirondack swing and enjoy the fragrant air. Highlights include more than 130 varieties of perennials, 6,000 flowering annuals, five different types of blueberry bushes, 20 apple trees, espaliered apple trees and an ornamental conifer bed. Vegetables, herbs and fruit produced at the garden are sold at The Pineland Farms Market and flowers are used in arrangements for tenant offices and special functions. Monthly Garden Tours are offered June through September. The garden also serves as an extended classroom for our Education Programs. The Garden at Pineland Farms is located behind the white cedar fence directly across from the Pineland Campus on the corner of Route 231 and Freeport Road. In spring, summer and fall, it is open to the public daily from 8:00 a.m. to dusk. The Garden can also serve as a unique venue for special events. To ensure the safety of all our visitors and our farm animals please note that Pineland Farms does not allow dogs on the premises.Thank you for your cooperation. The Lilac Garden, began its roots in the spring of 2016. Its entrance is located past the The Garden parking lot on Freeport Road. The Lilac Garden can be seen in the field to your left. Drive a little ways further for The Lilac Garden Parking lot and take a stroll through the field on a well maintained trail. Once you reach The Lilac Garden, immerse yourself in the scent of 34 different Lilac varieties. 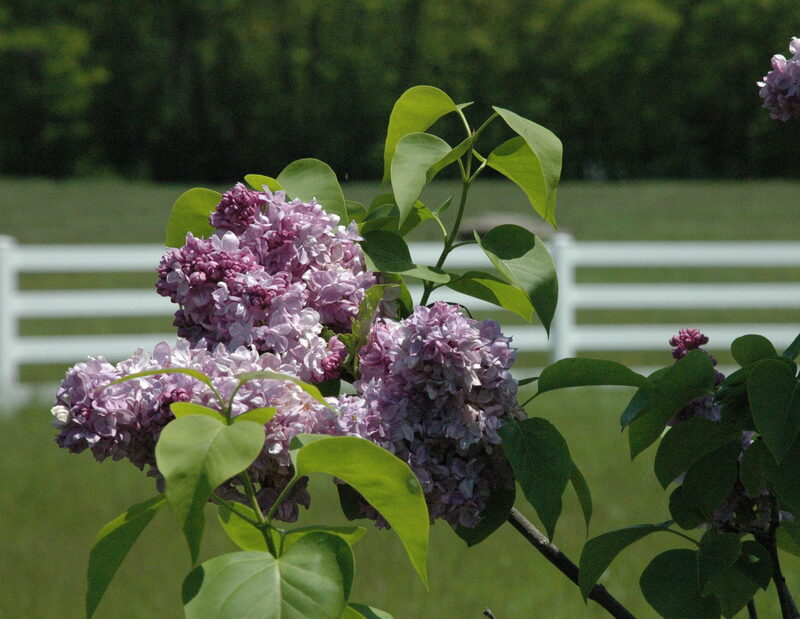 Most Lilacs have a short blooming period. The month of May will be the best time to see a wide range of lilacs in bloom. This garden also has a few varieties that bloom later or re-bloom throughout the season. You are welcome to peruse The Lilac Garden any time of year to see what you can find. The Cutting Garden on Valley Farm is enclosed in a white picket fence and has 3 rows of several raised beds for perennial & annual flowers and vegetables. Garlic, Yarrow and Delphinium come back every year. All the flowers and vegetables grown in the cutting garden can be bought at The Market during the flowering season. They are also used in arrangements for weddings and special occasions. Next to the Cutting Garden you will see a large vegetable garden called the Sensation Garden. This is where our Education Programs such as Harvest Take Home, Salsa Making and Bountiful Breakfast take place. Our Family Program attendees will learn about gardening, harvesting and making the most out of crops in a Maine vegetable garden. To learn more about our Education Programs please contact education@pinelandfarms.org. You will find our annual flower displays among the perennial beds in The Garden as well as in beautifully placed beds throughout the Pineland Farms Campus and Great Lawn. The Great Lawn is beautifully landscaped with water features, ornamental & native trees, and seasonally changing flower displays. Come enjoy a picnic by the gazebo, play some bocce or tennis and take in the view of Mt. Washington and the rolling hills in the distance. Over ten thousand flowering annuals and vegetables are grown from seed & plugs in our Greenhouse at The Produce Division site on Mayall Road in New Gloucester, Maine. Planting begins in March, the seedlings continue to grow in the Greenhouse until outdoor planting begins in June. Each fall as the weather cools and the annuals stop flowering 8,000 tulip bulbs and 2,000 daffodil bulbs are planted in these same annual beds. In Spring an amazing display of color decorates the property as the tulips and daffodils bloom. The Farmyard Garden is located behind the Education Barn on the Valley Farm. This garden space was originally designed as a landscape featuring dozens of varieties of trees, shrubs and plants that provided edible resources for both wildlife and people year after year. Now in addition you will find multiple raised beds, in ground gardens and a hugelkultur, or hill culture garden as well as an outside green play space. The farmyard gardens support our education programs, and offer a hands on learning opportunity for visitors of all ages. The big willow tree is an early season pollen source for bees and we have multiple medicinal perennials as well as a variety of vegetables, wild Maine berries, and many fruit trees. We welcome you to the Farmyard to visit the farm animals, play in the gardens and discover the native and agricultural plants grown in Maine.